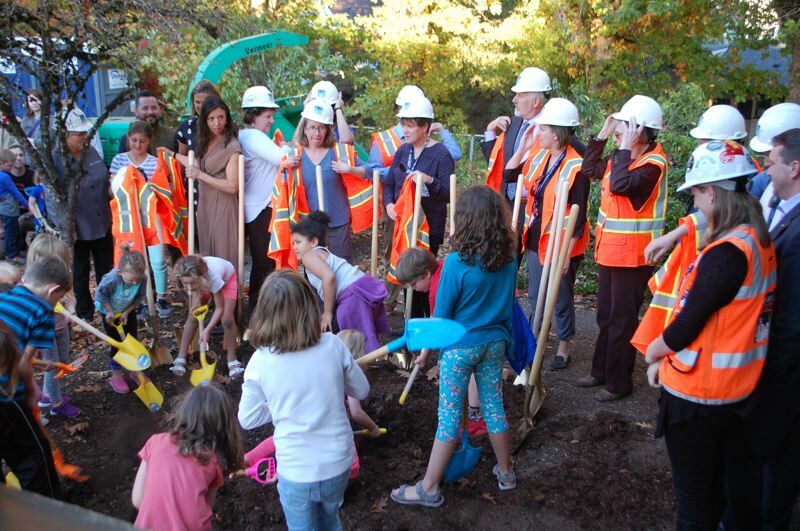 Milwaukie city officials celebrated the groundbreaking of the Ledding Library replacement last week in a ceremony that was decades in the making. Leila Aman, library project manager, acknowledged "the long road" that has led to this point. "This project has been, simply put, a labor of love," Aman said. 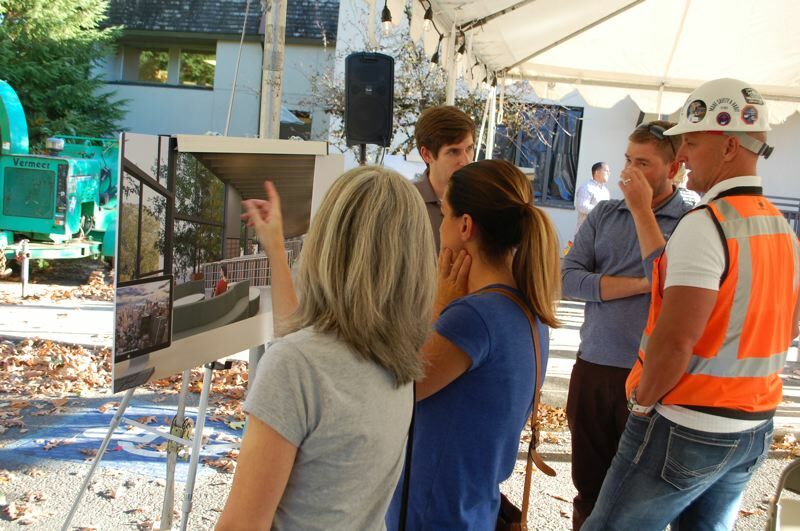 The groundbreaking originally was set for mid-2017. With a new library building seen as a city need since at least 1998, when the first building committee formed, the general attitude at the recent event was that a few additional delays were well worth the wait. A temporary facility was supposed to open Oct. 13, but electrical issues and other "unforeseen delays" led to the delay of that facility's opening until Monday, Oct. 22, at the TriMet Park & Ride, 9600 S.E. Main St.
Mayor Mark Gamba celebrated how the new library building will have positive impacts on the environment by using 85 percent less energy, even though the 20,000-square-foot building will be 50 percent larger than the old library. A 40-kilowatt solar array on the roof and radiant heating through the floors are among the technologies planned for the library to support Milwaukie's goal to become a net-zero city for carbon emissions by 2040. 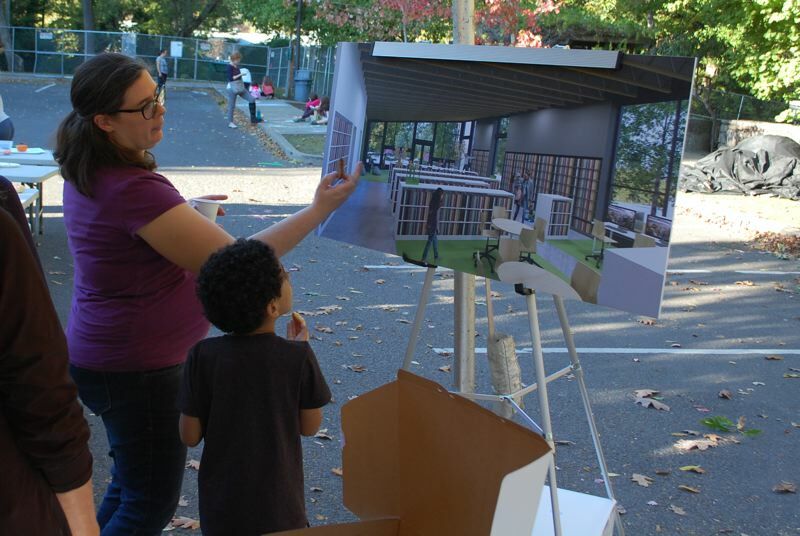 A constant presence throughout the entire project has been Milwaukie Library Director Katie Newell, who came to the city nearly seven years ago from New Castle, Delaware, where she oversaw a successful library construction project. City Councilor Angel Falconer, chair of the Ledding Library construction task force, discussed the "milestone" for Milwaukie as the ceremony broke ground on a new "heart of the community," serving not just Milwaukie's 20,000 residents but 20,000 more from unincorporated areas as well. "The construction costs have really skyrocketed through this whole process, so I'm so happy with the team that helped us make some tough decisions," Falconer said. Ann Ober, Milwaukie's city manager, was credited with holding the line on finances, as the project was delayed for more than a year. "She's the one who's had to make it actually buildable for the amount of money we have," Gamba said of Ober. Milwaukie's elected officials finally put a new library plan to voters in May 2016. Although voters approved the tax increase to pay for the new facility, the problem was that they had approved a renovation and expansion of the existing structure, not a replacement building. After voters approved the plan, city officials realized through further engineering studies that a replacement building would be necessary. A Clackamas County Circuit judge eventually stepped in to grant the city the authority to proceed with construction, despite the change in plans. Demolition of the old Ledding Library will begin next week, dependent on the timeline for salvaging parts of the historic building, such as doors and windows.